Summertime, and the livin’ is … hmm, not usually easy, only sometimes hard, but definitely full. Surprising, too, despite the ongoing droughty weather, the recent cool spell and nip of rain were enough to trigger the first, real flush of shiitakes on my mushroom logs this year, though I had to water them for a few days to bring them to full size. Some weeks are more stuffed than others, and the list of things to mention this week gives me plenty to tell you about. Ted here to offer the condensed version of our very, full week at Dancing Rabbit. Sunday began with an away game and a homecoming. 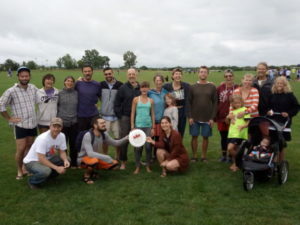 All the Ultimate Frisbee players who went to the Show Me State Games tournament played one final game in the rain, then trickled home from Columbia, after playing our hearts out as the Red Hill Rabbits against some of Missouri’s finest teams. We didn’t win any games, but we competed beautifully, fielding undoubtedly the most gender- and age-diverse team present, and players from four local communities. My daughter Aurelia was our youngest on Saturday, at age 12, eclipsed only by Sandhill’s Emory, who joined us Sunday, age 10. Red Earth’s Mark was our senior member at 53, and we were fortunate to include friends Mike and John from La Plata. Red Hill Rabbits team photo from the tournament. Photo by Ted. Maybe the most inspired part for me was that we all played consistently and as able/willing as we got more and more tired (we had four games Saturday), without preference for skill or outcome. No matter how hard-played a point, we had enough to send out fresh energy to the next line. Plenty of ice cream and some Thai and Indian food featured as well, helping fuel (or re-fuel) our play, and we were grateful to camp as a group again in Terra Nova community’s lovely back yard. My sore muscles and gamey legs only lasted three days. For some reason, almost nobody showed up to play for our regular Tuesday morning game. Whilst we were all away, Alline hosted a canning class at the Mercantile that I heard was super fun. The preservation season is certainly upon us. Our elderberries are heavy with sprays of dark purple berries, coming in ripening waves every few days. I have learned to see this underappreciated resource as a gift of nature, and to say, “Thanks, yes, please!” Especially in a dry year like this when their ability to bulk up with juice seems miraculous. Tereza and Aurelia and I all put in a lot of time early in the week stripping berries from the stem bits that impart a bad flavor. Aurelia’s (well-scrubbed) feet stomped up the half bucket-full of berries with sugar and I set them to an initial fermentation without added yeast, letting them go on the ample wild yeasts they carry on them, and mixing the mash a couple times over a few days. Toward the end of the week, I got the juice filtered into a carboy with an airlock to start secondary fermentation, filling the root cellar with a nice fresh aroma as it bubbles away happily once every second or so. Elderberry wine is said to take two years to mature to drinkability, so it is an investment in the future. But, if I make it every year, then I ought always to have a bit available. I do, in fact, have two carboys-full from each of the past two years just waiting to be bottled, already well-matured. Several of us have loosely talked about a bottling club to help each other get such tasks done. I, for one, seem to put it off unless I’m desperate to empty a vessel so I can refill it with incoming fruit. I have wine grapes nearly ready, and sweetening aronia berries alongside the still-accumulating elderberries, so the next batch will be a mixed-fruit edition and will need that space. My spare-time tasks for the week are already in place. Kyle turned project manager on revamping our circle drive area out toward Woehrle Road recently, and this week he was the conductor of an orchestra of big yellow machines as they thoroughly re-worked, graded, drained, and graveled our entry area. Numerous large, dump trucks of gravel and other fill showed up continually to lay new sheets of driveway and parking spots. Our mailboxes had to be uprooted from their long-time location for a few days and were seen lying along Woehrle where our mail carrier still kindly serviced them. I seemed to catch Kyle up there at various in-between moments, standing looking at one part or another in contemplation of progress and next steps. This project to widen entries for larger vehicles, smooth the curves, and add some additional parking has been in planning for many years, and now the gratification of change on the ground is finally at hand. The final, busy week of swim team ran its course this past week, beginning with the swim-a-thon Monday and progressing on through a triathlon, pool party, and awards ceremony, then a few more practices (including one episode of fully-clothed drills, for building endurance), and ending Saturday with the regional championships, an all-day affair in Quincy. I have not heard complete results but I gathered that Aurelia was part of the winning freestyle relay in the 11-12s. My budding teenager was very nonchalant about it. Big thanks go to Trinity Davis and the coaching team for their gifts of time and spirit to all those kids. Go team! While Sara and Aurelia were away at the meet, I stayed home for a goat barn work-party, where we finally made some onward progress on the structure after accumulating lumber for several weeks. We put up half the floor joists for the hay loft and we planned another work-party this coming week to put up the other half and start decking work. Seeing the bones of new structures take shape around here never ceases to please my sense of progress. Our fourth visitor program session rolled to a close, and as usual it was an excellent bunch of people, all smiles and attentiveness as they attended their various workshops and other activities. Evenings and other down times seemed to sprout spontaneous drumming and other music, and at least two visitors are staying on for a couple weeks in the village to experience some more. 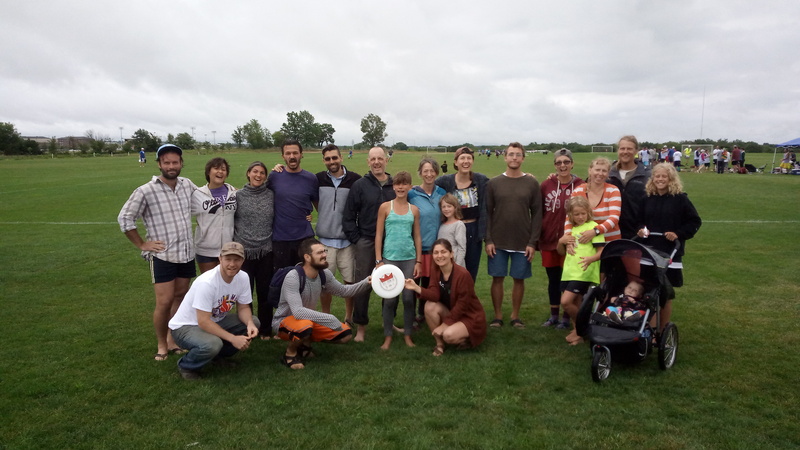 In other tidbits, Christina returned with Emma and Max from the East, which was lovely not only for those people themselves, but also for the Ultimate Frisbee roster, milking rotation, and kid play-scene. It did remind us that we were missing Javi, however, who is out in Washington State on a fire crew trying to stay hydrated in the heat and occasionally posting missives online about his time and efforts there. Despite the recent news of big fire in northern California, he reports he is staying put where he is, keeping smaller fires down. Stay safe, Javi! Colwyn hosted an evening of light fireworks down at the pond early in the week and followed it up several nights later with a showing of Black Panther, which I’d missed when it was in theaters and was glad to finally see. Our newest resident, Cat, began offering massage therapy sessions late in the week to the relief of a lucky few (Tereza scored the first appointment). It has been several years since we last had a practicing masseuse living in the village, and this is the season when we can certainly use those skills, as some of the above may suggest. I’m sad to report, though the eventual result will be wonderful, that we’ll be letting Thomas go at the end of the weekend. He’s off to spend most of the rest of the year as a journeyman timber-framer with an outfit over in Illinois. He’ll undoubtedly return enriched with new expertise and old tools to share for future village building efforts, but it’ll be a bit of a trial to get by without him and all the quiet, essential ways he helps keep this place going. Thankfully, the proximity means we may still catch the odd glimpse of him during his absence. Wrapping up the week, our second plenary meeting for Village Council selection produced an agreed slate for the coming year (starting September), when Alyx, Troy, and Vick will join Christina and Ted in service to the community’s decision-making work. Thanks go to all those who were willing to step up and offer themselves to the cause and the deliberation that allowed us all to reach that consensus. Later Sunday evening, out at Starlight Fire Circle near the swimming pond, the tri-communities’ mens group hosted a ceremony to celebrate Nathan’s choice not to have his own kids, but to support instead those already here, and generally work in all the ways he does to make the world a more just, compassionate, and livable one for all of us. We wrapped up the gathering with a little irreverence in the form of an adapted Monty Python tune from The Meaning of Life and sat around the fire together afterward in the fading light with quiet voices and bright Mars rising in the southeast. I leave you this week with notice of our upcoming annual Open House, one month out on September 8, from 1-4 pm. Every year we enjoy the chance to welcome the public into our village (now with improved traffic flow and parking!) with tours, talks, local products, and a festive atmosphere. We hope you’ll put it on your calendar and come join us once again to see what our growing village and nonprofit are up to. Hope to see you there. Until next week, thanks for reading, friends! Want to see what living cooperatively is really like? Come visit us this year to get a glimpse into how we live and how you can incorporate these practices into your own life. There is only one Sustainable Living Visitor Program sessions left and several more workshops happening between now and October, how will you choose to get involved?